Recently actor Yang Se Jong sat down for an interview to talk about his upcoming drama, “30 but 17,” which co-stars actress Shin Hye Sun. “30 but 17” is a new Monday-Tuesday drama from SBS about a woman who fell into a coma at 17 and wakes up at age 30 (Shin Hye Sun) and a man who has withdrawn from the world (Yang Se Jong). It is written by Jo Sung Hee (“She Was Pretty“) and directed by Jo Soo Won (“I Hear Your Voice“). Japanese fans are in luck (so are the Taiwanese & Koreans) since they are close by. Because it has been decided that TSUTAYA Premium will held Yang Se Jong's first fan meeting in Japan on October 19, 2018 at Team Smile, Toyosu PIT. Time: 18:00 (Open for entrance). 19:00 Start. LMAO, like why are they all hosting it overseas rather than in South Korea itself first?! “30 but 17” has released photos of Yang Se Jong and Ahn Hyo Seop displaying their bromance ahead of its premiere on July 23! “30 but 17” is a romantic comedy about Woo Seo Ri (Shin Hye Sun), a woman who falls into a coma at 17 but wakes up 30, and Gong Woo Jin (Yang Se Jong), a man withdrawn from the world due to a traumatic experience he goes through at 17. Ahn Hyo Seop plays 19-year-old Yoo Chan, Gong Woo Jin’s nephew and protector. In the photos, Woo Jin and Chan spend some quality time together on a nicely decorated rooftop under the night sky. As if he is complaining to Woo Jin about something, Chan stares at somewhere far into the distance as he tells his story. Woo Jin in turn softly observes Chan. In another photo, Woo Jin pats Chan’s head, his eyes and laughter full of warmth. Pleased with Woo Jin’s affectionate gestures, Chan smiles gently at Woo Jin. Chan is like a big puppy in front of his uncle Woo Jin. Through the drama, the relationship between the two men will be explored, as Woo Jin, a man who has turned his back on the world due to events from the past, melts in front of his nephew Chan and shows a warm and considerate side of himself. Chan, on the other hand, will play the role of staying close to Woo Jin as he looks over him and also smoothes over Woo Jin’s injuries. “30 but 17” premieres on July 23 at 10 p.m. KST and will be available on Viki! Shin Hye Sun, laughing, said, “That’s a lie,” but Yang Se Jong denied, nudging Shin Hye Sun with his elbow and saying it’s true. 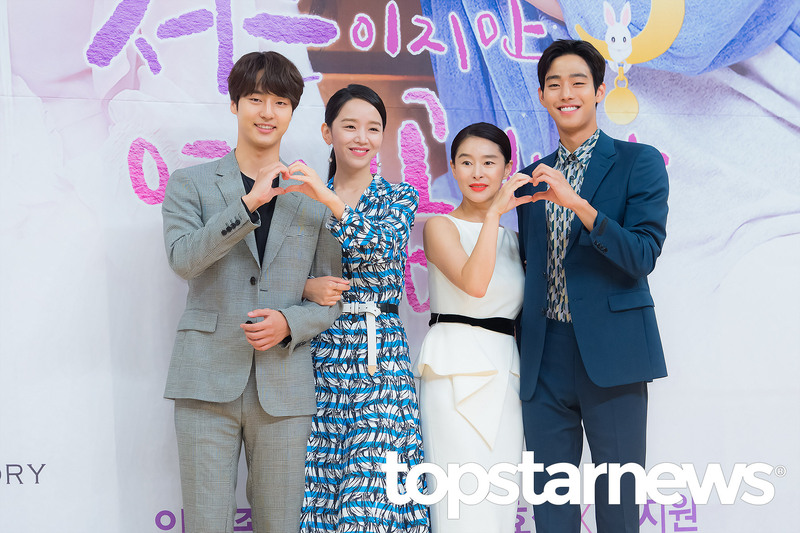 Shin Hye Sun then revealed that she was a big fan of Yang Se Jong. “Our staff knows, but even up until last year, when we were in the car, we would talk about Yang Se Jong. Se Jong nudging Hye Sun took me by surprise, because when he promoted TOL with Seo Hyun Jin, he was reserved, shy and maintained a respectful distance towards Hyun Jin in terms of interactions. With Hye Sun, this means he's much more comfortable with her, which is a very good thing (as it means I can expect good on-screen romance). [News] 2018.07.21 More Character Still from "30 but 17"
[News] 2018.07.22 Yang Se Jong Looks Displeased by Shin Hye Sun's Back Hug in Upcoming Drama "30 but 17"
SBS’s new Monday-Tuesday drama “30 But 17” released new stills of Shin Hye Sun giving Yang Se Jong a back hug. “30 but 17” is a story about a woman named Woo Seo Ri (Shin Hye Sun) who falls into a coma at 17 but wakes up 30 and a man named Gong Woo Jin (Yang Se Jong) who is withdrawn from the world. The released stills show an awkward and shocking moment between the two characters. Shin Hye Sun stares at Yang Se Jong with wide eyes and gaping mouth, and Yang Se Jong looks stiff and angry as he glares coldly at her. Her fist is tightly clenched, as if she urgently wants to say something to him. In another photo, Shin Hye Sun can be seen giving Yang Se Jong a back hug. Despite the romantic notions of a back hug, Yang Se Jong looks anything but happy as he stands there in a rigid stance with his head lowered. Viewers who catch the fact that Shin Hye Sun may be wrapping her pink cardigan around his waist instead of giving him a loving embrace are curious about what happened in the scene. SBS is actively promoting the drama right now by releasing more new stills luring attention from viewers/readers since it's soon to air next Monday. It's asking us to find out why Shin Hye Sun is giving Yang Se Jong a back hug, and the answer is quite obvious - Se Jong accidentally sat on her Choco Pie, so she took her jumper off to cover it, which therefore made it look like she is giving him a back hug. [Instagram] 2018.07.22 Good People Update IG of Yang Se Jong on the Set of "30 but 17"
In addition, former Romantic Doctor, Teacher Kim's former co-star, Yoo Yoon Seok sends his support to the "30 but 17" with Samgyetang and food truck to the set. Nawwww, how sweet of him! Actor Yoo Yoon Seok in support of "30 but 17" team - Hwaiting. [Press Con] 2018.07.23 Yang Se Jong Attends Press Conference for "30 but 17"
[Press Con - HD] 2018.07.23 Yang Se Jong Attends Press Conference for "30 but 17"